Three Brits are still in the running at the WSOP including a 64-year-old grandad from Yorkshire who normally only plays in £10 tourneys in Hull. The WSOP will be going “on tour” soon after the Main Event ends - with WSOP International Circuit events planned at the amazing Iguazu Falls in Argentina from August 2-8 and Rotterdam (August 25 to September 2). John Hesp, who is competing at the WSOP because it was on his “bucket list”, goes in to Day 7 with a massive 20,880,000 stack. He has never played anything like the WSOP in his life but is now guaranteed at least $263,532 after making it to the final 27 in the toughest and most prestigious poker tournament on the planet. 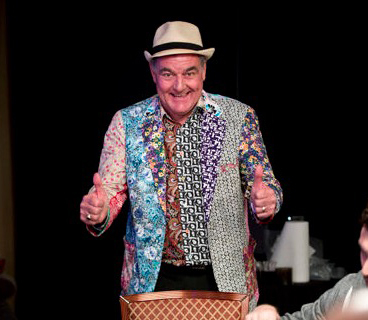 John has already attracted a lot attention at this year’s WSOP for his brightly-coloured patterned shirts – lent by a friend from home, the seaside town of Bridlington in Yorkshire. His biggest cash before now – and in fact his only tournament win – was when he won a £10 tourney last month at his nearest casino, Napoleons, in Hull. That event had a field of 51 – compared to the 7,221 entries for this year’s WSOP – and John won £785. All his recorded cashes have come in the last nine months in Napoleon’s regular £10 tourneys and amount to just £1,745. British online pro Jack Sinclair in is the top three counts of the $10k WSOP Main Event with just 27 players left. Sinclair, who rarely plays live and has just $13,500 in recorded cashes to his name, bagged up 27,535,000. Sinclair, 26, who is based in Malta, only came to Vegas after being persuaded by his friends Philipp Gruissem and Anton Morgenstern; now he’s super-deep and in with a real chance of making the final table. He started Day 6 with just 30 big blinds but has managed to grind it up to more than 27m. All players left in this year’s WSOP are guaranteed at least $263,532 and the winner will get $8,150. Everyone who reaches the final table is guaranteed at least $1 million. The current chip leader is Christian Pham who finished the night with 31,440,000, just ahead of EPT Malta runner-up Valentin Messina on 28,590,000. The third Brit still in the running is Omaha specialist Richard Gryko. Gryko will be back for Day 7 with 13,760,000. He already has more than $1m in live tournament winnings to his name including an earlier cash at this year’s WSOP when he finished 255th in the massive 888poker Crazy Eights tournament. Other big names still in contention include Michael Ruane, who was 4th last year for $2,576,003, former November Niner Antoine Saout, French pro Benjamin Pollak and veteran Dutch pro Marcel Luske. Among those who bust on Day 6 was Max Silver who finished in 45th place for $176,399. The Dublin-based pro has had a great WSOP after winning his first bracelet in the $3k Limit Hold’em 6-Handed event just 18 days ago for $172,645. Paul Vas Nunes was 55th for $121,188 while Artan Dedusha finished 52nd for $145,733. Upcoming WSOP International Circuit events include: Argentina (August 2-8) and Rotterdam (August 25 to September 2). Stops in Campione, Brazil, Rozvadov, St Maarten, Paris, Sydney and Punta del Este in Uruguay are all on the schedule for this year with four more stops planned for 2018 including Marrakech and Tbilisi in Georgia.